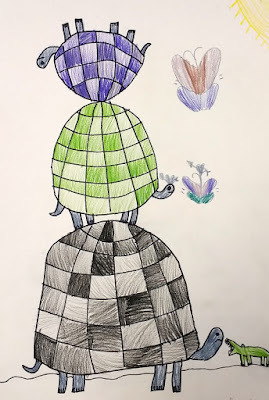 This lesson builds on what the 2nd graders learned about using lines to emphasize the form of a subject in their Starry Night Pumpkins lesson. It also introduces them to the art element of color value, which they use in coloring their turtle shells. We use color pencils for the coloring because of the relative ease of producing different values of the same color simply by applying different pressure when coloring.